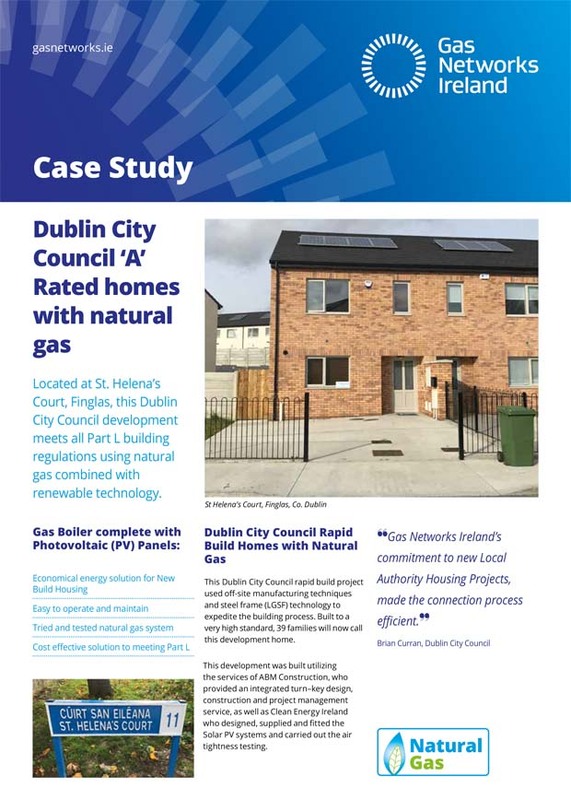 Dublin City Council Rapid Build – ‘A’ Rated homes with natural gas. Located at St. Helena’s Court, Finglas, this Dublin City Council Rapid Build development meets all Part L building regulations using natural gas combined with renewable technology. This Dublin City Council project used off-site manufacturing techniques and steel frame (LGSF) technology to expedite the building process. Built to a very high standard, 39 families will now call this development home. Furthermore, owners will be able to come in, switch the heating on and enjoy instant and controllable space heating and hot water thanks to natural gas. A modern solution for a modern home.